>> Should You Travel to Doha, Qatar During Ramadan? 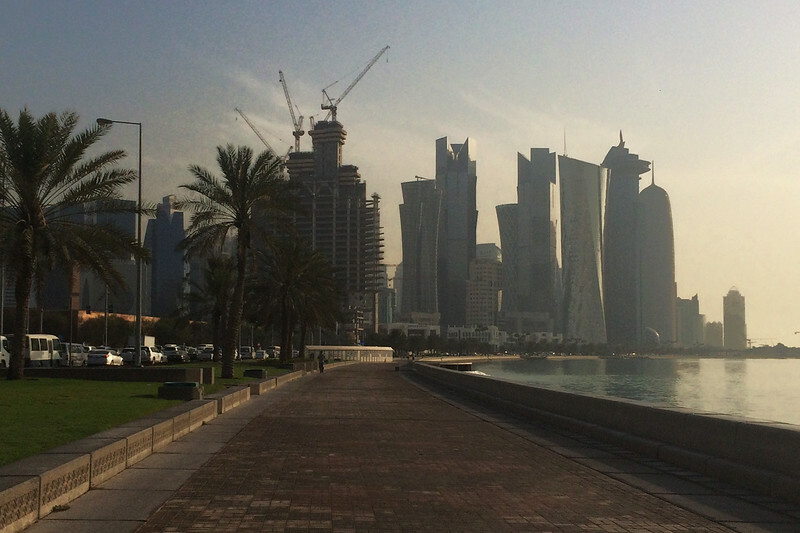 The city of Doha from the Corniche. Can you travel to Muslim countries during Ramadan? Good question. I can’t speak for all of them, as I haven’t travelled as extensively through the Middle East as I would have liked. 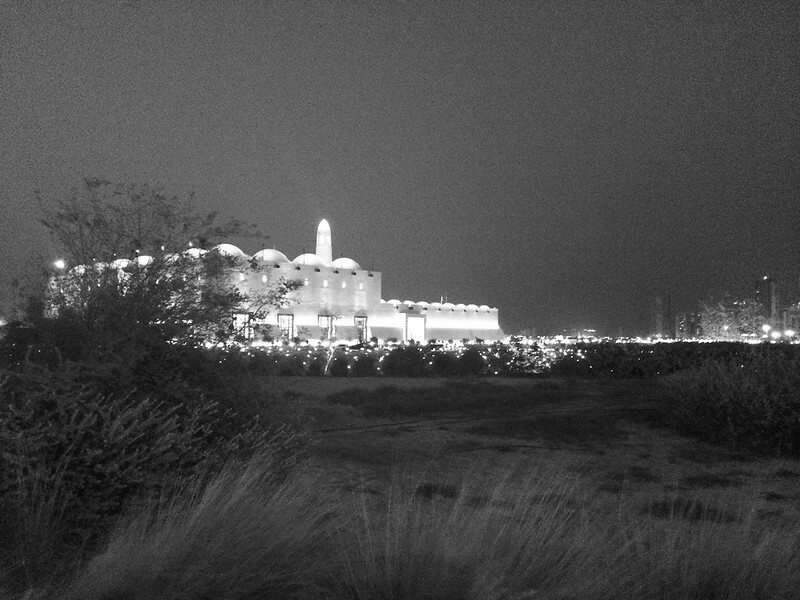 Yet, I did spend a handful of months living and working in Doha, Qatar a few years ago… and one of those months happened to be Ramadan. As someone who’d spent half their life in rural Australia, it was an eye (and mind)-opening experience and then some. Ramadan is an incredibly special time for the Muslim community. Observed on the ninth month of the Islamic calendar year, it is when observant Muslims will fast from dawn to dusk. That’s no food and no water during daylight hours for the entire month. A single sip of water would break the fast. Some also abstain from gossip and arguments, as well as any sort of physical intimacy during daylight hours. Why? Well, from my understanding, it’s seen as way to purify oneself both on a physical and spiritual level. At sunset, the community will get together to break their fast. This meal is known as an “iftar” (a large feast) and is shared with family and friends. Mosques will also traditionally set up large tents, where free iftar meals are offered. The fasting is broken at the end of the month, with a three-day holiday called Eid al-Fitr, where children will receive gifts and families will share large meals together, in the daylight hours. Do you have to participate in Ramadan, if you’re in a Muslim country? In places like Doha and I imagine Dubai, it is acknowledged that a large portion of the population are expats, Western or otherwise. They are not expected to fast, but you are strongly encouraged to observe the local customs, which is a perfectly reasonable request. You’re not allowed to eat or drink in public – even a sip of water can get you into trouble. The dress code, which is actually pretty lenient considering it’s an Islamic country, is more heavily enforced at this time of the year. There are more police out and about, patrolling the city centre and corniche, their very presence enough to keep everyone in line. Related: How Safe is it for Women to Travel in Doha? This doesn’t mean you yourself have to fast, although I always felt weird eating or drinking in front of anyone who was observing Ramadan. I have a few friends who are Muslim and hung out with them during the month. I remember spending an entire afternoon hanging around with one of them in my hotel room, playing boardgames. When he eventually left to break his fast, I realised that I hadn’t drunk any water for going on six hours. I usually get through about 2-3 litres a day, ramped up to 3-4 in a desert setting. At least I didn’t have to wonder where my dehydration-induced headache had come from. Eid can be quite pretty. Can you do anything during Ramadan? Within the confines of a hotel room, life goes on pretty much as normal (except they banished chocolate hour from my hotel – which was when free chocolate platters were presented to guests. This was really upsetting, as you can imagine). You can still work out or go swimming and all the restaurants are still open, as are the supermarkets. You’re not going to starve, if that’s what you’re asking and so long as you eat in a private space, you’ll be right as rain. Doha at least, does shut down during the month. The bars and clubs close, not even opening at night. The stores that sell alcohol shut for the month and the lines outside the front of them in the days leading up to Ramadan are… impressive. I’m not so sure about activities for travellers being available, as I worked for most of the month. 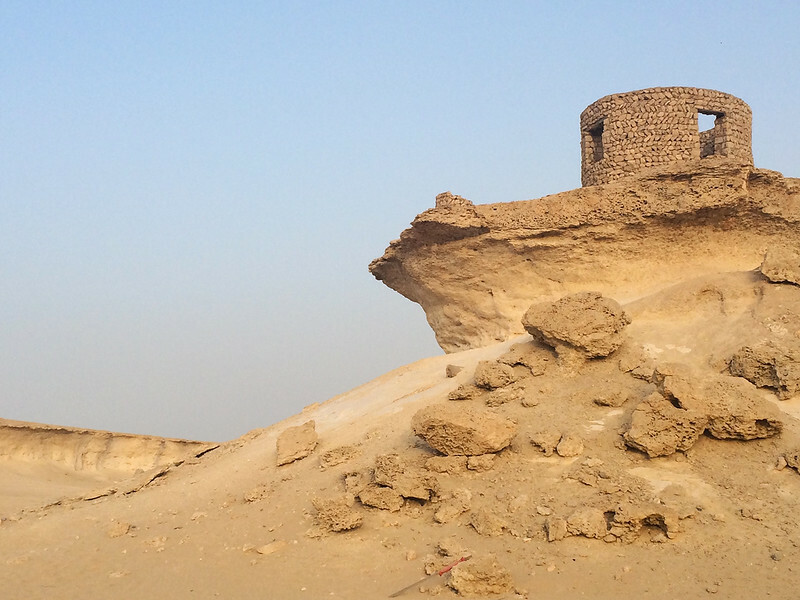 If you’re travelling to the region and want to get out and see the desert, you’d be best off contacting a company like Qatar Adventures to ask if they run tours during Ramadan. I think the Islamic Art Museum remains open and in the Souq Waqif, it was business as usual come sundown, which is only ever when I went in any case. 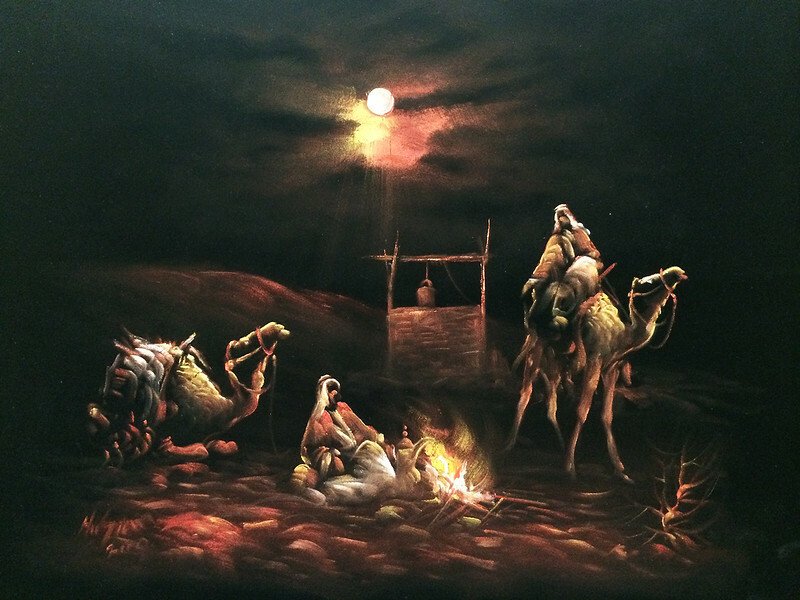 This is a painting I saw in the souq that I really liked and truly kick myself for not buying. Dating is frowned upon in general, as it’s considered impolite for men and women to touch in a public setting (and homosexuality is not tolerated). It doesn’t stop the expat community from mingling at any case. In fact, I don’t think I’ve ever had as much success in dating (as in pulling date after date, not finding someone I actually wanted to be with longterm!) as I did whilst in Doha, nor come away with so many stories. From recollection, I was seeing someone right up until Ramadan started (the two events weren’t related) and was enjoying a mild flirtation with a friend by the time the month was over. However, he actually was fasting and I was working loads, so we couldn’t really hang out much until Eid had been and gone. The city comes back to life, as the Eid festivities begin. Everything reopens, with expats celebrating by hitting the clubs hard and going to bottomless brunches together (I went to one sober and can tell you that those things get messy!). My friends and I celebrated by going to Gordon Ramsey’s all-you-can-eat-chilli-hotdog-Tuesday night and staying overnight in the desert. A few weeks later, I left the country and haven’t been back since. My honest opinion? I would avoid it, if you can. Mostly because there’s just not that much going on. If it’s somewhere you actually want to visit and experience, time your holiday for one of the 11 other months of the year. Or alternatively, come during the end of Ramadan. You’ll get a bit of an idea of what the month is about and you’ll be there for Eid, which is quite a nice celebration. Living through it is a different story and one that I’m personally glad I experienced. There are obviously a lot of misconceptions around Islam that are flinging their way around the world at the moment. And whilst culturally there were a lot of aspects of life in Doha that I didn’t agree with – the treatment of migrant workers, women and animals all come to mind – I’d still never regret spending the time that I did there. It opened up my eyes and my mind to the world outside of Australia and trust me, that can only ever be a good thing. Have you lived or travelled to a Muslim country during Ramadan? If not – would you? If you like this post, please stick a pin in it! I didn’t realise that it was happening and so only went once before hand. It remains one of the biggest regrets of my life.